Moskalkova and Council of Europe Human Rights Commissioner visit jailed Ukrainian sailors | Russian Legal Information Agency (RAPSI). 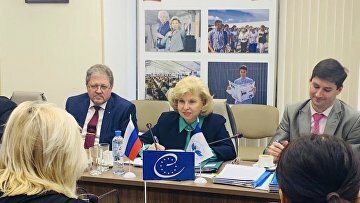 MOSCOW, April 3 (RAPSI) – Russia’s ombudsman Tatyana Moskalkova and Council of Europe Commissioner for Human Rights Dunja Mijatović visited Ukrainian sailors charged with illegal border crossing in the Kerch Strait in a Moscow detention center on Wednesday, the ombudsman’s press service told RAPSI. Earlier on Wednesday, Moskalkova met Mijatović in her Moscow office. They discussed the work of Russia’s human rights institution, nature of complaints filed with her office and mechanism of the violated rights restoration in Russia. A special focus was on the strengthening of humanitarian cooperation.